Full of whimsy and curiosity, this "Office of Curiosities" tapestry shows an array of office items from 18th century France. Here we see feather quills, diaries, scrolls, coins, and a comb, amongst other items. This tapestry shows a beautifully harmonious color palette with reds, oranges, browns and tans pervading, well suited to the 18th century French office feel. Luxury, yet with curiosity is the them in this delightful work. 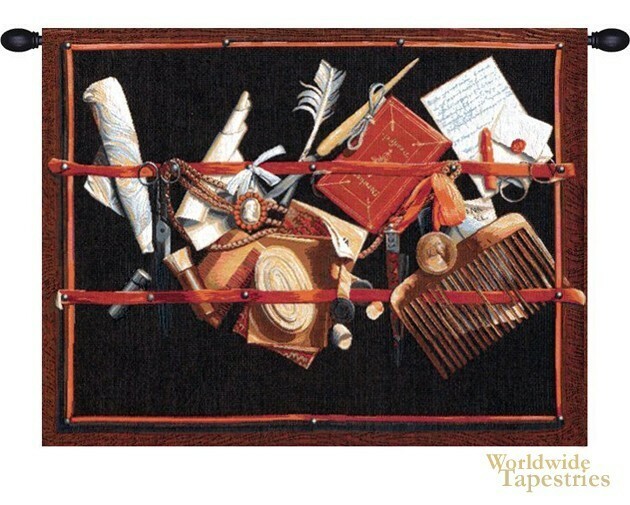 This art tapestry "Office of Curiosities" is backed with lining and a tunnel for easy hanging. Note: tapestry rod and tassels, where pictured, are purchased separately. Dimensions: W 26" x H 19"
Dimensions: W 38" x H 29"